One of the main topics in research activity of Prof. Auricchio is gene therapy of ocular diseases based on adenoassociated viral vectors (AAV). The retina is an ideal organ for gene delivery since several vectors are able to transduce it efficiently and for long-term. Several progressive inherited diseases affect the eye, whose genes have been identified and for which animal models are available to test therapies. For most of retinal inherited diseases there is no current therapy available. Gene replacement therapy might be a successful therapeutic option for inherited retinal degenerations. In addition different therapeutic strategies based on gene transfer can be developed for retinal neuroprotection or for treatment of common ocular diseases as diabetic retinopathy and age-related macular degeneration. 1) Creation, production and purification of vectors based on adeno-associated viruses (AAV). 2) Regulation of gene expression in the retina transduced with viral vectors. A crucial issue to bring retinal gene transfer from bench to bedside is the ability to regulate gene expression. Prof. Auricchio and coworkers described successful attempts at regulating gene expression in the retina [Dejneka et al, 2001; Auricchio et al, 2002; Lebherz et al, 2005; Allocca et al, 2007]. 3) Development and application of viral vectors for retinal gene transfer. One of the main focus of the research of Prof. Auricchio is the identification of adeno-associated viral (AAV) vectors for retinal gene transfer. To this end he contributed to the discovery that different AAV serotypes may transduce different cell types in the retina with different efficiency of transduction [Auricchio et al, 2001]. Prof. Auricchio applied AAV-mediated retinal gene transfer to various animal models of retinal diseases as Stargardt disease, Retinitis Pigmentosa, oculo-cutaneous albinism type I and ocular neovascularization and in this respect he described the recovery of the visual function in an animal model of Ocular Albinism following AAV-mediated OA1 retinal gene transfer [Surace et al, 2005]. Prof. Auricchio tested new strategies to bypass one of the major limitations of AAV vectors, the size of packaged DNA, considered to be up to 4.7Kb. The first strategy was based on the possibility to rebuild an entire molecule of beta galactosidase after retinal administration of two viral vectors containing each one of the 2 halves of lacZ transgene [Reich et al, 2003]. The second strategy was based on the discovery that the AAV 2/5 serotype is able to transfer large size genes, up to 8.9Kb. 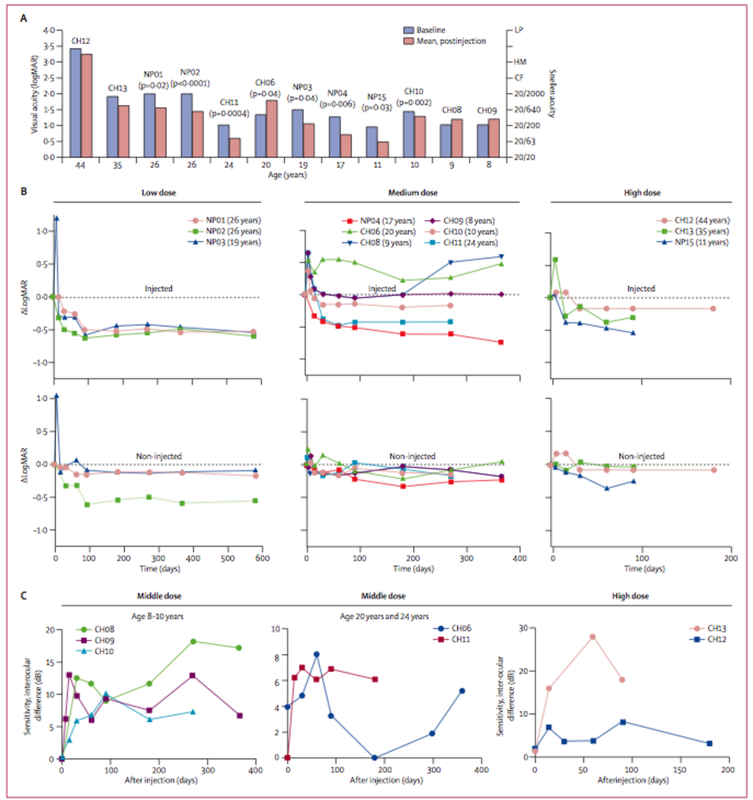 Prof. Auricchio’s research group has shown that AAV vectors with the AAV5 capsid can efficiently transfer the ABCA4 gene, mutated in Stargardt disease, in vitro and in vivo resulting in expression of protein of the appropriate size and function and resulting in significant amelioration of the retinal phenotype of Abca4 -/ mice. This represents the first proof-of-principle that AAV can be used for gene therapy of Stargardt disease [Allocca et al, 2008]. More recently Prof. Auricchio started a large collaborative effort with Prof. Simonelli at the Department of Ophtalmology of the Second University of Naples (SUN) establishing a true “from bench to bedside” program. He collaborated to genotype-phenotype correlation studies in Italian patients with Leber congenital amaurosis [Simonelli et al 2007] and Stargardt disease and, importantly, he has contributed, in collaboration with the team of Dr. Jean Bennett at University of Philadelphia, to set-up one of the first clinical trials of gene therapy for inherited ocular diseases, which has included 5 Italian patients with Leber congenital amaurosis from a total number of 12. All patients showed significant improvement of visual function following subretinal AAV administrations, in absence of important side effects (Fig. 1) [Maguire, Simonelli et al. N Engl J Med. 2008 May 22;358(21):2240-8.; Maguire AM, High KA, Auricchio A, et al. Lancet. 2009 Nov 7;374(9701):1597-605; Simonelli F, Maguire AM, et al. Mol Ther. 2010; 18(3):643-50]. Correlation of age with visual acuity in the injected eye. Visual acuity at baseline was compared with the mean visual acuity after injection (all timepoints included); a worsened visual acuity was noted in CH06. p values for significant differences are reported. Change in logarithm of the minimum angle of resolution (LogMAR) scores in the injected and controlateral non-injected eyes is indicated as a function of time for patients given low, medium, and high doses of vector. LogMAR score was normalised to 0 at baseline for each individual. Most patients in the middle and high dose groups were tested for full-field sensitivity to white light before and after injection. LP=light perception. HM=hand motion. CF=counting fingers. 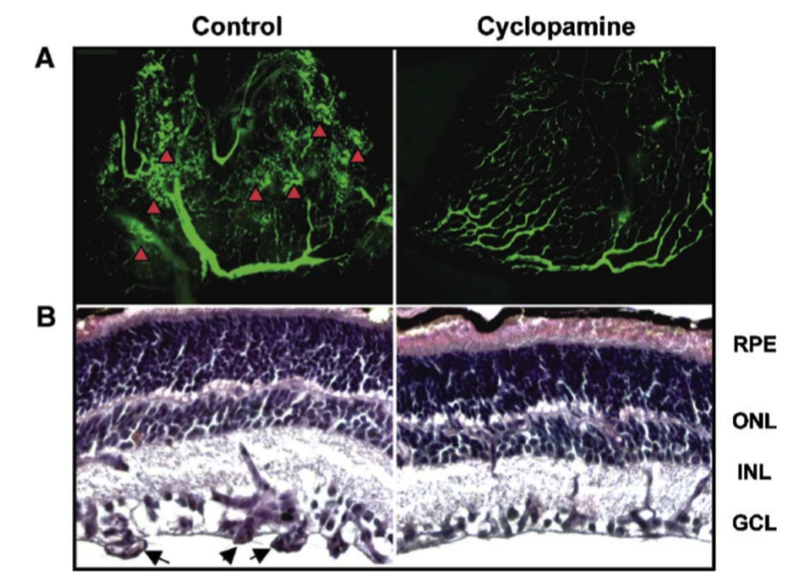 AAV-mediated gene transfer of Erythropoietin was used to inhibit retinal degeneration in animal models of retinitis pigmentosa [Rex et al, 2004]. In addition, to treat autosomal dominant form of retinal degenerations, adeno associated viral vectors coding for small double stranded RNA were used to inhibit the expression of a toxic rhodopsin protein into transgenic rat and mouse retina, models of a common dominant form of retinitis pigmentosa [Tessitore et al, 2006; O’Reilly et al, 2007]. gene transfer of molecules exerting anti-angiogenic activities resulted in the inhibition of ocular neovascularization [Auricchio et al, 2002]. Prof. Auricchio and coworkers demonstrated that the signal system of Sonic Hedgehog is necessary for physiological formation of retinal vasculature and during the neovascularization in animal models of retinopathy of prematurity and choroid neovascularization. Inhibition of the the Sonic Hedgehog signal significantly reduces retinal neovascularization in these models [Surace et al, 2006] (Fig. 2). 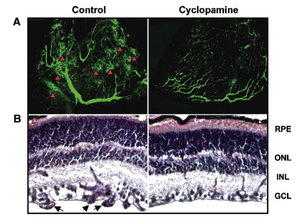 Cyclopamine inhibits murine hypoxia-induced (ROP) retinal neovascularization. (A) Angiographic and (B) histological photographs of ROP retinae at P17 from animals treated with daily (P12 to P16) subcutaneous injections of cyclopamine (50 mg/kg) (right) or vehicle alone (left). Neovascular areas after in vivo perfusion with fluorescein isothiocyanate dextran are evident as tufts and effusions (indicated by arrowheads) in the ROP retinae and substantially reduced or absent in the control retinae (n = 13/group). PAS staining (B) of retinal sections confirmed that pathological capillaries internal to the inner limiting membrane in the ROP retinae are importantly reduced when ROP animals are administered with cyclopamine. RPE, retinal pigment epithelium; ONL, outer nuclear layer; INL, inner nuclear layer; GCL, ganglion cell layer; arrowheads, neovascular capillaries. Gene therapy mediated by AAV for treatment of murine models of: peripheral nerve; muscular dystrophies; lysosomal storage diseases. 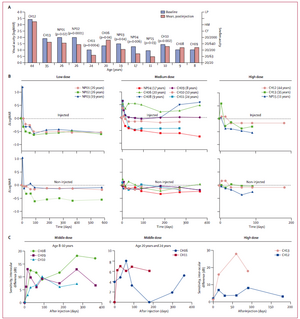 Gene therapy of type I Diabetes. Allocca M, Doria M, Petrillo M, Colella MP, Hoyos G, Gibbs D, Kim SR, Maguire A, Rex TS, Di Vicino U, Cutillo L, Sparrow JR, Wiliams DS, Bennett J and Auricchio A (2008) Serotype-dependent packaging of large genes in adeno-associated viral vectors results in effective in vivo gene delivery. J. Clin. Invest. 118(5):1955-64. Auricchio A, O'Connor E, Hildinger M, Wilson JM (2001-a) A single-step affinity column for purification of serotype-5 based adeno-associated viral vectors. Mol Ther;4(4):372-4. Auricchio A, Rivera VM, Clackson T, O’Connor E, Maguire AM, Tolentino MJ, Bennett J, Wilson JM (2002) Pharmacological regulation of protein expression from adeno-associated viral vectors in the eye. Mol. Ther. 6(2):238-242. Auricchio A *, Behling KC *, Maguire AM, O’Connor E, Bennett J, Wilson JM, Tolentino MJ (2002) Inhibition of retinal vascularization by intraocular viral mediated delivery of anti-angiogenic agents. Mol. Ther. 6(4):490-4. *these two authors contributed equally to the work. Dejneka N*, Auricchio A*, Maguire A, Ye X, Gao GP, Wilson JMW, Bennett J (2001) Pharmacologically-regulated gene expression in the retina following transduction with viral vectors. Gene Ther. 8(6):442-6. *these two authors contributed equally to the work. Hildinger M, Auricchio A, Gao GP, Wang L, Chirmule N, Wilson JM (2001) Hybrid vectors based on adeno-associated virus serotype 2 and 5 for muscle directed gene transfer. J. Virol. 75(13):6199-203. O’Reilly M, Palfi A, Chadderton N, Millington-Ward S, Ader M, Cronin T, Tuohy T, Auricchio A, Hildinger M, Tivnan A, McNally N, Humphries M, Kiang AS, Humphries P, Kenna PF and Farrar GJ. (2007) RNAi interference-mediated suppression and replacement of human rhodopsin in vivo. Am. J. Hum. Genet. 81(1):127-35. Reich SJ, Auricchio A, Hildinger M, Glover E, Maguire AM, Wilson JM, Bennett J (2003) Efficient trans-splicing in the retina expands the utility of adeno-associated virus as a vector for gene therapy. Hum. Gene Ther. 14(1):37-44. Rex TS, Allocca M, Domenici L, Surace EM, Maguire AM, Lyubarsky A, Cellerino A, Bennett J, Auricchio A (2004) Systemic but not intraocular Epo gene transfer protects the retina from light- and genetic-induced degeneration. Mol. Ther. 10(5):854-61. Simonelli F, Ziviello C, Testa F, Rossi S, Fazzi E, Bianchi PE, Fossarello M, Signorini S, Bertone C, Galantuomo S, Brancati F, Valente EM, Ciccodicola A, Rinaldi E, Auricchio A, Banfi S. Clinical and molecular genetics of Leber's congenital amaurosis: a multicenter study of Italian patients. Invest Ophthalmol Vis Sci. 2007;48(9):4284-90. Simonelli F, Maguire AM, Testa F, Pierce EA, Mingozzi F, Bennicelli JL, Rossi S, Marshall K, Banfi S, Surace EM, Sun J, Redmond TM, Zhu X, Scindler KS, Ying GS, Ziviello C, Acerra C, Wright JF, McDonnell JW, High KA, Bennett J, Auricchio A (2009) Gene Therapy for Leber's Congenital Amaurosis is Safe and Effective Through 1.5 Years After Vector Administration. Mol. Ther. 18(3):643-50. Surace EM, Domenici L, Cortese K, Cotugno G, Di Vicino U, Venturi C, Cellerino A, Marigo V, Tacchetti C, Ballabio A, Auricchio A (2005) Amelioration of both Functional and Morphological Abnormalities in the Retina of a Mouse Model of Ocular Albinism Following AAV-Mediated Gene Transfer. Mol. Ther. 12(4):652-8. Surace EM, Balaggan KS, Tessitore A, Mussolino C, Cotugno G, Bonetti C, Vitale A, Ali RR, Auricchio A (2006) Inhibition of ocular neovascularization by Hedgehog blockade. Mol. Ther. 13(3):573-9. Tessitore A, Parisi F, Denti MA, Allocca M, Di Vicino U, Domenici L, Bozzoni I, Auricchio A (2006) Preferential silencing of a common dominant rhodopsin mutation does not inhibit retinal degeneration in a transgenic model. Mol. Ther. 14(5):692-9.